I am grateful for the invitation to be with you this morning. And I am grateful for your witness for life. I find it truly distressing to live in a nation—admirable in so many ways—where state-sponsored violence remains so common. This violence becomes terribly ironic given the reputation the United States of America has of being a “Christian” nation. And, in fact, survey show that being a self-identified Christian makes it more likely that an American citizen will support war, the death penalty, and torture. What the hell? So, this is an opportunity. If we oppose war, the death penalty, and torture—and if we identify as Christians—we have some theologizing to do. At least that’s what I think. One area where we might get somewhere is with a biblically grounded theology of justice—of, what I will call restorative justice. Such a theology provides tools for opposing the theology of retributive justice that is so popular in America, the theology that underwrites so much of the violence we decry. Psalm 85:8-13: God the Lord will speak peace to God’s people who turn to God in their hearts. Surely salvation is at hand. Steadfast love and faithfulness will meet; justice and peace will kiss each other. Faithfulness will spring up from the ground, and justice will look down from the sky. Justice will go before the Lord, and will make a path for the Lord’s steps. Amos 5:6-7, 21-24: Seek the Lord and live, you who turn justice to poison. God says this to you: I hate, I despise your festivals, and I take no delight in your solemn assemblies. Even though you offer me your sacrifices, I will not accept them. Take away from me the noise of your songs; I will not listen to the melody of your harps. But let justice roll down like waters, and righteousness like an ever-flowing stream. Romans 3:21-24: Now, separate from works of the law, the justice of God has been disclosed, and is attested by the law and the prophets, the justice of God through [the faithfulness of] Jesus Christ for all who believe. For there is no distinction, since all have sinned and fall short of the glory of God; they all are now justified by God’s grace as a gift through the redemption that is in Christ Jesus. This entry was posted in Biblical theology, Justice, mercy, peace theology, Restorative justice and tagged peace theology, restorative justice on December 20, 2016 by Ted Grimsrud. In February, 2015, I was privileged to be a guest on a radio show, Community Justice Talks, on KHEN-FM, Salida, Colorado. The show’s host, Molly Rowan Leach, interviewed me for about half an hour. We talked about an article I had written, “Violence as a Theological Problem” and my two books, Instead of Atonement: The Bible’s Salvation Story and Our Hope for Justice, and The Good War That Wasn’t—And Why It Matters: World War II’s Moral Legacy. The recording of that interview is now available. Here’s a link to a page that allows visitors to listen to the interview directly or to download a podcast. Or it can be listened to here as well. What follows is an edited written transcript of the interview. Molly Rowan Leach—This is Community Justice Talks. And I’m your host, Molly Rowan Leach. And you’re listening to KHEN-LP Salida, Colorado, 106.9 FM. You can stream us at khen.org. It’s great to be here today and I am really looking forward to the conversation that we’re about to have with Professor Ted Grimsrud from Eastern Mennonite University. He’s on the line live with us, coming from his university back east in Harrisonburg, Virginia. Here on Community Justice Talks we like to talk with people from local and statewide as well as nationwide movements towards solutions in conflict and crime. This show aims to provide hope, solutions, and to have an open, honest dialogue about justice that is unfiltered—at the very personal as well as communal and national levels. Further on in the article, Ted talks about restorative justice. And of course at Eastern Mennonite University, there’s a powerful program called the Zehr Institute for Restorative Justice that was spearheaded by Dr. Howard Zehr, who is considered and honored as one of the wayshowers and leaders of the movement here in the United States, at least of the modern movement. This entry was posted in God, mercy, Restorative justice, violence and tagged Christian ethics, God's mercy, Justice, restorative justice, violence on June 17, 2015 by Ted Grimsrud. What difference does it make to assert that nothing is as important for our theology as pacifism (i.e., the cluster of values which include love, peace, shalom, wholeness, kindness, mercy, restorative justice, nonviolence, and compassion)? I propose that one difference pacifism makes (or should make) is to cause pacifists to look critically at all justifications for violence – and to question all theological underpinnings for such justifications. In this essay, I will focus critically on one case – theological underpinnings that help justify acting violently toward children (what is commonly called corporal punishment). I want to discuss six points concerning the theological problem of the justification of violence against children. (2) A theological framework, that I will call “the logic of retribution”, underlies the rationale for the use of violence against children. In “the logic of retribution,” God is understood most fundamentally in terms of impersonal, inflexible holiness. God’s law is seen to be the unchanging standard by which sin is measured. Human beings are inherently sinful. God’s response to sin is punitive. Jesus’ death on the cross is necessary as a sacrifice to provide the only basis for sinful human beings escaping their deserved punishment. (3) Consistent pacifists must raise theological concerns here. When God is understood, as with the logic of retribution, primarily in terms of impersonal holiness, legal requirements, and strict, vengeful justice, the biblical picture of God as relational, compassionate, and responsive is distorted. (4) Not only is it justified according to problematic theological assumptions, corporal punishment also has problematic practical consequences. It may well intensify the dynamic of responding to violence with violence, actually educating young people into the practice of using violence. It may also contribute to a stunted experience of life for its recipients. (5) Given that all theology is humanly constructed, we may (and must) reconstruct our understanding of God in order to foster consistently pacifist theology and practice. This entry was posted in Justice, Pacifism, Restorative justice, Salvation, Theology, Uncategorized and tagged peace theology on May 17, 2014 by Ted Grimsrud. This entry was posted in Biblical theology, Jesus, Pacifism, Restorative justice, Salvation and tagged peace theology, salvation on April 23, 2013 by Ted Grimsrud. The faith community is central to biblical religion. In the Bible, from the start (the calling of Abraham and Sarah in Genesis 12 to bring forth a community meant to bless all the families of the earth) to the end (the vision in Revelation 21–22 of the churches witness leading to the healing of the nations), this community has the vocation not simply to serve its own interests but to serve the interests of all the families of the earth. I have written a little book reflecting on this vocation as a central theme of the Bible as a whole, suggesting what I call “God’s healing strategy” as a narrative key for interpreting the overall message of the Bible. The “strategy” is simply that God has called together a faith community to know God’s healing love in its common life and to witness to that healing love in a way the serves to bless all the families of the earth, that brings healing to the nations. This motif recognizes the need the human family has for healing. We hurt each other. We violate each others’ dignity, sometimes in terribly destructive ways. A key aspect of the healing motif then may be seen as the issue of how to we respond to the inevitable harm we do to each other in ways that does not add to the harm. Based on the Bible’s core message, the community of faith is central in the effort to respond redemptively to harm. 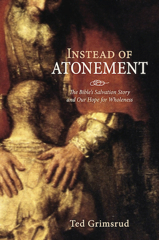 And a key part of redemptive responses, of course, is forgiveness. When Michael Hardin asked me to prepare a discussion paper for this conference that would discuss the theme of “how the church might look if it was grounded not in victimage but in forgiveness,” I said sure, that I would be happy to since I was in the midst of teaching a course at Eastern Mennonite University I called “Topics in Theology: Vengeance and God.” I figured I could draw on materials from that class. This was a new class for me and back in mid-September when Michael contacted me, I wasn’t quite sure where the class would go. As it turned out, the class pretty much did go the direction I hoped it would – concluding with a lively discussion on forgiveness and the centrality of the church in the embodiment of forgiveness as the ultimate Christian response to harm-doing. Forgiveness may most usefully be understood not simply as pardon, a letting of wrongdoers off the hook, so much as a way of life, a set of practices, that brings an end to the cycle of enmity but also effects transformation in the wrongdoer, the survivors of the wrongdoing, and the broader community that is effected by the wrongdoing. This entry was posted in Justice, Pacifism, Restorative justice, Salvation, Theology and tagged pacifism, peace theology, restorative justice, revenge, vengeance on June 19, 2012 by Ted Grimsrud. Our criminal justice system certainly is troubled by tendencies to treat some people (offenders and victims) without love; the consequences are costly. From a Christian perspective, and simply for the sake of social wellbeing in our society, we need to challenge those tendencies. This paper will address three issues: (1) On what bases do people think they can deal with offenders without love? That is, what views of God, ultimate reality, and justice justify unloving (retributive) approaches to criminal justice? (2) Is it possible to construct an understanding of God, ultimate reality, and justice, based on the founding texts of the Christian tradition (i.e., the Bible), which supports Tolstoy’s assertion about the fundamental law of life being love? (3) Is it possible in “real life” to approach criminal justice issues from the point of view of Tolstoy’s assertion that love is foundational? Despite the widespread occurrence of inter-human violence throughout most of recorded history, few people would deny that most human beings have an inclination to avoid violence toward other human beings. In human experience we usually need some overriding reason to go against this inclination. That is, to act violently toward, especially to kill, other human beings, is serious business, undertaken because some other value, commitment or instinct overrides the inclination not to be violent. Punishment involves, by definition, the intentional infliction of pain and the use of coercion and thus must be seen as a form of violence. Punishment by the state, then, is morally problematic as it involves the state doing things that are normally considered morally and socially unacceptable. The problematic nature of punishment has given rise to a huge variety of justifications for delivering such pain. This entry was posted in Justice, Pacifism, Restorative justice, Theology and tagged Criminal justice, peace theology, restorative justice, Theology on June 10, 2012 by Ted Grimsrud.